HowMechanismWorks ? 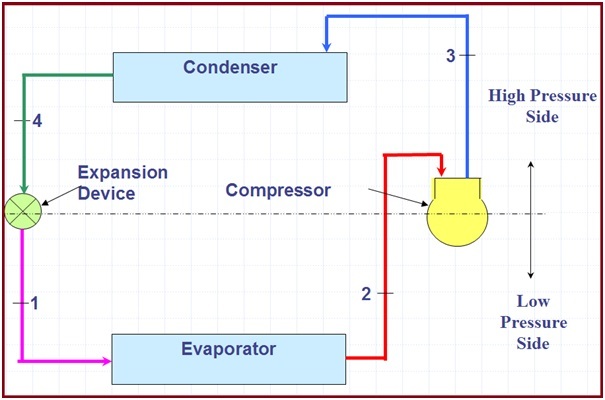 : What is Vapour Compression Refrigeration Cycle ? How Does It Works ? What is Vapour Compression Refrigeration Cycle ? How Does It Works ? 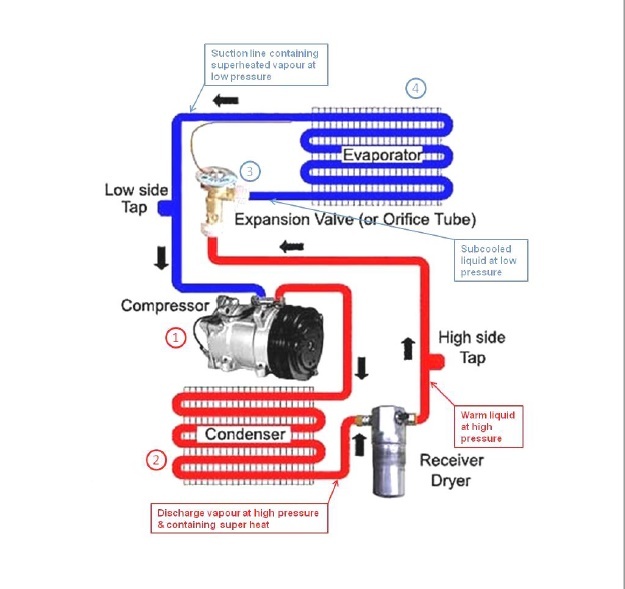 What is Vapour Compression Refrigeration Cycle ? General overview of a Vapour Compression Refrigeration Cycle is, Hot compressed vapour leaves a compressor & is liquified in a condenser by heat exchange with cooling air or water. The liquid refrigerant then passes through an expansion device & the low pressure liquid enters the evaporator. It absorbs the heat from the medium to be cooled & the refrigerant is vaporized. The vapour enters the compressor and is raised to a higher pressure & the cycle continues. A vapour compression refrigeration cycle or system are the most commonly used among all refrigeration & airconditioning systems. As the name implies, these systems belong to the general class of vapour cycles, where in the working fluid (refrigerant) undergoes phase change at least during one process. In a vapour compression refrigeration system, refrigeration is obtained as the refrigerant evaporates at low temperatures. The input to the system is in the form of mechanical energy required to run the compressor. Hence these systems are also called as mechanical refrigeration systems. Vapour compression refrigeration systems are available to suit almost all applications with the refrigeration capacities ranging from few tons to few megatons. A wide variety of refrigerants can be used in these systems to suit different applications, capacities etc. The above figure illustrates typical vapour compression refrigeration cycle & it has a certain necessary parts whose use & principle will be explained. In any vapour compression refrigeration system, there are two different pressure conditions. One is called the lowside and the other side is called the high side. The evaporator is in the low side. Heat is absorbed in the low side. The Expansion device & suction line are also on the low side. The receiver or dryer, condensers in the high side. This is where the heat is released from the refrigerant. The compressor is on the high side. Under atmospheric temperature & pressure the refrigerant is in gaseous form. As we know from the law of refrigeration that cooling takes place when liquids evaporates to become gas. Therefore we must first transform the refrigerant gas into into liquid form. Most gaseous can be made into liquids by raising its pressure & then cooling it. The equipment that increases the pressure of the gas by compressing it is called the Compressor. The compressor compresses the refrigerant in the gaseous state. During the process of compression however the refrigerant becomes hot. This is because of the heat gain from the compressor due to work done. This heat has to be removed to enable the gas to condense into a liquid easily. The equipment that removes the heat called the condenser. Subsequently, the refrigerant in liquid form at high pressure flows through the expansion valve, they are bundle of tubes (expansion or control device). The expansion valve is a component fitted between the condenser and evaporator with the function of creating a significant drop in pressure. This valve performs two functions: first of all, it ensures the correct quantity of liquid refrigerant is sent to the evaporator, and in addition it creates a pressure differential that is essential for the completion of the cycle. The pressure differential is very important in a refrigerant circuit, as it changes the boiling point of the fluid. Without this pressure change, no cooling would take place and the system would simply be a container of liquid refrigerant. Evaporation process is carried out in evaporator which is generally known as cooling coil. Inside the cooling coil the pressure is low, because of the expansion device on one side and the compressor suction on other side. In the low pressure, the liquid refrigerant starts evaporating rapidly. While evaporating it needs sensible heat to transform itself from the liquid to the gaseous state. So it soaks up heat from the surrounding tubes, and from the air, with which the tubes are in contact. This causes the cooling. This is end of the cycle & beginning of the next cycle, after the evaporation process is done, the refrigerant is back in gaseous form. It is sucked into the compressor where it will be compressed again for the next refrigeration cycle.